Open...and Shut By Silicon Valley standards, Red Hat is a loser. It doesn't have an app store (though it once tried to create one). Its chief executive isn't a fresh-faced kid (though Jim Whitehurst doesn't look much older than 20). And its headquarters isn't in San Francisco or Silicon Valley, but rather in the comparative backwoods of North Carolina. Yes, Red Hat does have a somewhat silly name, but it hardly compares to goofy names that pass for creative genius in the Valley. And yet Red Hat is very cool with three sets of people that matter a great deal - customers, partners, and investors - and its growth suggests that the company could well become the defining technology company of the 21st Century. Just like its former CEO, Matthew Szulik, always said it could be. Why? Because Red Hat is building a gravitational force that investors, customers, and partners can't easily ignore. Quarter after quarter, Red Hat delivers exceptional results. Not just good, but consistently great. This despite free food or deep-tissue massages in its break rooms. As The 451 Group analyst Matthew Aslett suggests, it's questionable that "any other [open source] vendors will achieve or better the scale achieved by Red Hat." This is why investors are paying a premium on Red Hat's stock with one of the highest price-to-forward-sales ratios in the software industry. It's also why customers collectively shell out hundreds of millions of dollars each year for Red Hat products, despite the fact that they may actually be paying a premium for Red Hat's open-source goodness. A big part of this is the pull of Red Hat's money machine to a widening array of third-party developers. Red Hat has become the central unifying agent for the broad Linux ecosystem, with Novell's SUSE in sharp decline and Canonical's Ubuntu still catching up. The theory of enterprise software is that it is cheaper to buy an off-the-shelf solution and configure it to your needs instead of building exactly what you need from scratch. Some companies are great at using off-the-shelf products and others waste a lot of money. But for most companies, the trade-off works. It is cheaper to buy and configure than to build. What is less widely known, is that the range of processes covered by standard software is modest. [S]tandard software covers about 20 percent of the processes in any given business....An IDC report I once read estimated that 33 per cent of the revenues of the enterprise software industry went to the big players and the rest, 67 per cent, went to the huge collection of smaller companies that developed software for specialized industries and functions. In other words, there is a persistent long tail opportunity in business software. The big products solve the most common problems but 80 per cent of the processes and 67 per cent of the revenue go to niche players. The big players realize this and seek to encourage developers to fill those niches based on their development platforms. Some of these big players are better at the developer-attraction game than others. Microsoft mastered this game long ago, while Salesforce.com and VMware are increasingly adept at rallying developers around their flags. And then there's Red Hat, king of the Linux and open-source crowd. It's also sitting at a fortuitous moment in software history, when the industry is shifting to the cloud, which is essentially an open-source phenomenon in terms of its composition. 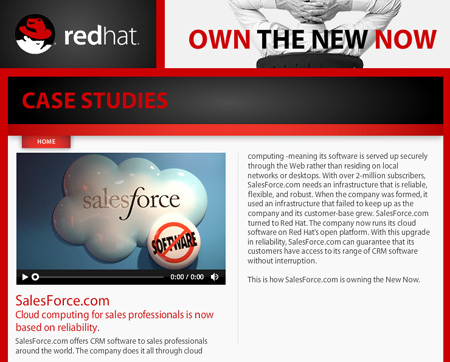 In fact, Red Hat has become so essential to enterprise infrastructure, that even competitors like Salesforce build on Red Hat technologies. Yet, Red Hat has its challenges. Despite Dan Woods' declaration of the importance of the "long tail opportunity in business software," Red Hat has never proved particularly good at embracing this group, preferring instead to focus on its biggest partners (IBM, Oracle, HP, Dell, SAP and others). Red Hat, of course, has always had a laser-like focus on tight operations and near-term revenue opportunities, which makes it hard for the company to dabble in the second and third tiers of the software community - its RHX program perhaps demonstrating this most poignantly. Also, though Red Hat dominates the Linux field, it's not much of a rendezvous point for open-source businesses or developers, generally. It's telling that the big buyers of open-source companies have been VMware, Salesforce, and Oracle. And it's also problematic for Red Hat that many enterprise developers are moving to non-paid Linux distributions like CentOS and Ubuntu. This wouldn't be a big deal except for the fact that some of these companies - like SpringSource, acquired by VMware - have million-strong developer communities, communities somewhat shielded from Red Hat's pull by the demands of the new owner. [M]ost companies are looking to standardize on one or at most two vendors for their middleware needs and therefore, we believe that it's important to have that full portfolio, certainly anchored by the application server that's something that's relatively ubiquitous that you need to have. So I do think it's necessary to have that full portfolio, when company's look for who they are going to partner with in their core application infrastructure. So, we think it's important to have those in various pieces. We continue to release new version and add to our product portfolio there. So, it's still really primarily the other full-line Oracle and IBM as our key competitors. Whitehurst was referring to the company's JBoss business, but the same is true of its cloud portfolio, recently augmented by the Makara acquisition. Matt Asay is senior vice president of business development at Strobe, a startup that offers an open source framework for building mobile apps. He was formerly chief operating officer of Ubuntu commercial operation Canonical. With more than a decade spent in open source, Asay served as Alfreso's general manager for the Americas and vice president of business development, and he helped put Novell on its open-source track. Asay is an emeritus board member of the Open Source Initiative (OSI). His column, Open...and Shut, appears twice a week on The Register.